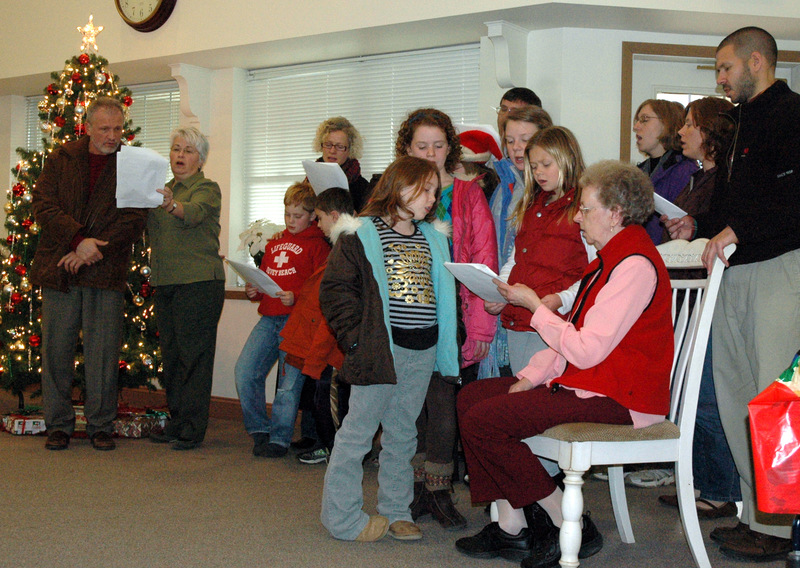 Holy Trinity parishioners spread the joy of the season by caroling to area shut-ins. It seems like yesterday when the summer heat was upon us. [Now we have entered] the transformative period called Thanksgiving and Christmas. It is a marvelous and sacred time in our church calendar. Advent is a forgotten 40 days of invitation to renew our commitment to our Lord Jesus Christ. It is forty days to inventory the quality and direction of our lives. It is forty days to avail ourselves of the opportunity of saving our souls. By the Grace of God it is a time to bring balance, holiness, peace and purpose to our lives. Thanksgiving and Christmas become meaningless and devoid of joy if we only see it as a time of just feasting. Indeed, we ought to also fast, according to our church guidelines. We ought to learn self-denial and bodily self-discipline. But if we only center the Holy season on our stomachs, eating or not eating we miss the whole spiritual purpose. A saying attributed to the Holy Fathers of the church says: “The devil does not eat, he does not drink and he does not marry and this great ascetic formally is not less a devil”. We must put this into the proper context. Fasting should be a means to draw us closer to God by focusing on Him. In addition to food considerations, the holidays should be a time of spiritual growth and personal life changes. Keep skid chains on your tongue; always say less than you think. Cultivate a low, persuasive voice. How you say it, often counts more than what you say. Never let any opportunity pass to say a kind and encouraging word to or about somebody. Praise good work, regardless of who did it. If criticism is needed, criticize helpfully, never spitefully. Be interested in others, their pursuits, their work, their homes and families. Make merry with those who rejoice; with those who weep, mourn. Let everyone you meet, however humble, feel that you regard them as a person of importance. Be cheerful. Don’t burden or depress those around you by dwelling on your minor aches and pains and small disappointments. Remember, everyone is carrying his own cross. Keep an open mind. Discuss, but don’t argue. It is a mark of a superior heart to be able to disagree without being disagreeable. Let your virtues speak for themselves. Refuse to talk of another’s vices. Discourage gossip. It is a waste of valuable time and is extremely destructive. Be careful of another’s feelings. Wit and humor at the other person’s expense are rarely worth it and may hurt when least expected. Pay no attention to ill-natured remarks about you. Remember, the person who carried the message may not be the most accurate reporter in the world. Simply live so that nobody will believe them. Don’t be anxious about the credit due you. Do your best and be patient. Forget about yourself, and let others remember. Practice forgiveness and charity. Editor’s Note: The Rev. John Bakas is Dean of St. Sophia’s Cathedral in Los Angeles, CA. The article appears courtesy of the Greek Orthodox Metropolis of San Francisco.